Appointed co-ordinator of Humberside Co-operative Development Agency (HCDA) Humberside wide organisation. Post was based in Scunthorpe but came to office in Hull regularly as part of her role. Worked with David Burnby, Brenda Sims and Andy Carlton (Andy now co-operative business advice worker in Africa). Moved to Hull in 1991. Giroscope Co-operative (now a charitable organisation) was supported by the CDA. Chris Snell (North Hull Adventure Playground and community activist) part of co-op All That and T Shirts Too. Also still in Hull, Bryn Ellis who set up a secondary co-operative theatre company. Karen Spooner who was a development worker at Hull CVS was the CVS representative on the CDA Steering Group. Kevin Curley, then Chief Officer of Hull CVS, identified the need for a central resource and supported services with offices for embryo voluntary and community organisations. When St. Wilfrid’s RC primary school became surplus to Humberside County Council requirements’, and with funding from both Humberside CC and Hull CC, the building was refurbished to form suitable office and meeting room space. Karen Spooner was the lead development worker responsible. Centre 88 opened and was run by Wendy Powell who was appointed Centre Manager. Initially part of Hull CVS, the organisation quickley became a charity in its own right. Liz Shepherd, Chief Officer of Humberside Federation of Community Organisations (HFCO) was appointed Chair of the Trustees; Karen Spooner remained as the CVS representative on the Board of Trustees, and when Jean took over the manager’s post at Centre 88 in 1994, Karen was the Chair. Jean managed Centre 88 from 1994 – 2013. The Trustees were appointed either from tenant organisations, or from other local voluntary/community groups which had a connection to Centre 88 through use of its services i.e. printing, meeting facilities, etc. In that way the tenants and users retained a strong interest in the organisation. the organisation won Lottery funding of £359,000 to make the building accessible. Liz Shepherd who by this time was Chair of Lonsdale Community Centre helped with advice having won Lottery funding for a similar project at Lonsdale. Centre 88 was self-financing through the charging of rents and other services, although always run on a shoe string, and with a strong commitment from its three staff (total 70 hours per week) and volunteers to maintain the fabric of the building and provide a quality service to users. Centre 88 provided management support to small groups such as DITTO (an IT group for disabled people), The Haven Project (physiological support to refugees and asylum seekers), bookkeeping services to Spin Off Productions (providing education through theatre). Centre 88 was a member of the Voluntary Sector Alliance (VSA) set up by Hull CVS, and its government funded successor, Hull Community Network. The Network was established to build capacity to enable the sector to become involved with, and provide a voluntary sector perspective to the local strategic partnerships. When funding for the Network ended, the sector was no longer able to maintain its involvement with the partnerships. Funding for voluntary sector and local authority organisations became scarce following the global downturn. This lack of funding affected tenants and users, many of which closed or were forced to cut back in various areas of their work, and the knock-on effect to Centre 88 eventually forced the organisation to seek a merger in order to survive. Organisation merged with its sister organisation Hull CVS, following which Jean’s post became redundant. 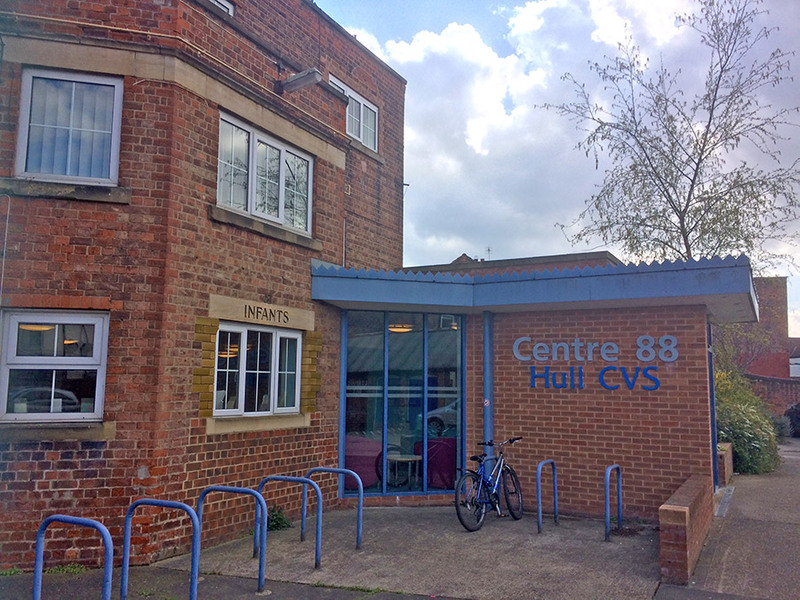 Centre 88 has survived as a service within Hull CVS to provide office accommodation and meeting facilities to a range of voluntary and charitable organisations and groups in Hull. Although the initial emphasis on supported services has changed and many of its longer term tenant organisations are well established, it still offers accommodation and meeting facilities at a reasonable rate which enables new groups to have a base in the City. Jean is proud of her 19 years of commitment to the organisation and the voluntary sector generally. She continues to provide voluntary support to DITTO and Spin Off Productions. If government genuinely wants a quality voluntary and community sector involvement in local services it needs to pay for it. Voluntary and community organisations cannot provide services solely through the use of volunteers. Paid workers are required to run organisations and support volunteers. The voluntary sector has become fractured and organisations set against each other due to changes in funding support and commissioning processes. The cheapest bid will not necessarily provide the best service. Organisations veer away from their original reasons for being, due to commissioning processes i.e. Hull CVS which was an infrastructure organisation providing advice and support to organisations now no longer fulfils that role.